Trevor took a short walk from his front porch and stood in the morning shadows of the douglas fir in his front yard to check the weather. 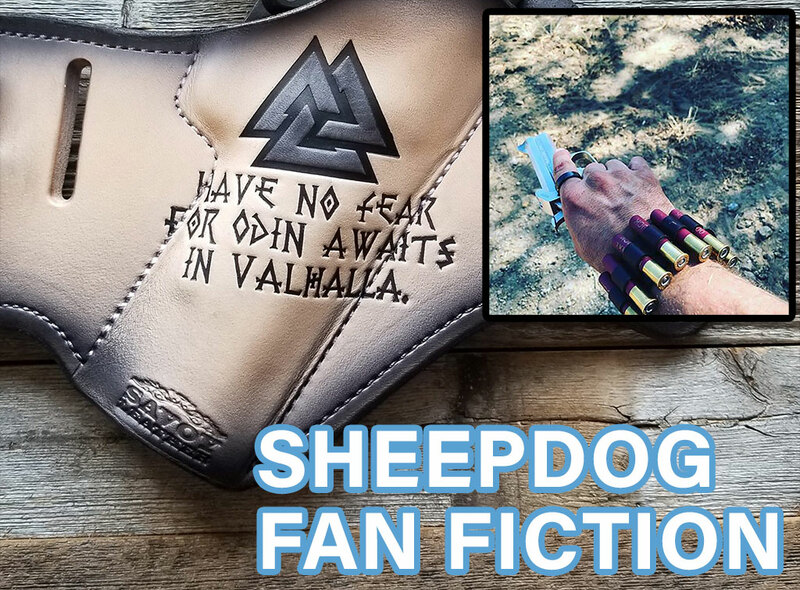 He slowly grazed the calloused forefinger of his right hand back and forth across the debossed lettering on his outside the waistband Savoy Leather holster; “HAVE NO FEAR FOR ODIN AWAITS IN VALHALLA”. It served as a reminder to himself, and as “a warning to the canis lupus” Trevor liked to smugly recite when people asked; knowing they damn well wouldn’t know it was latin for wolf. His feeling of mental superiority further skyrocketing after typically mumbling “Ovis aries…” (latin for domestic sheep) under his breath. Trevor didn’t particularly enjoy interacting with the sheep; it was simply his duty. A 24 hour per day grind that involved peak situational awareness and readiness. His sheepdog senses were on high alert today, after recent local newscasts were reporting increased teen mischief in the area. This is exactly why Trevor decided to forgo his usual braided paracord bracelet in favor of the .410 buckshot bracelet. Trevor knew from experience that even the sight of .410 was a major deterrent to a teen wolf plotting wolf things. Combine that with the Bond Arms pistol in the aforementioned fancy holster, peacocking on an obnoxiously loud red white and blue painted leather belt with the embellished phrase “STAND DOWN BECAUSE I WON’T”; another mantra Trevor lived by, and was ready to die by if need be. Convinced that the open flannel button-up shirt combined with a greyman fishing vest he had on was low-key enough and weather appropriate for the day, he turned around to go back inside his house. Barely out of the shadow of the immense douglas fir, he stopped dead in his tracks… the hair on the back of his neck standing up. Trevor could hear a rumble like that of a freight train coming from the steep hill out of sight, a few houses over and around the corner from his house. It was getting increasingly louder. His heart beating quickly, he pulled out the bond arms body dropper .410, rushed back into the shadows, and bladed at a tactical 45 degree stance towards the threat. Suddenly, six laughing teens on skateboards appeared. Trevor reverted back to his training, doing 360 degree search and assess… scanning for more threats. Convinced there were only six teens, he visually locked in on them in case they tried anything. Laughing and joking, the teens were doing ollies and hitting mailboxes with their backpacks on their way down the street. Not on my watch thought Trevor as he readied himself, breathing deeply and steadily. Thanks for reading m’lady’s 🎩👌 & fellas. Hope you have a splendid weekend.